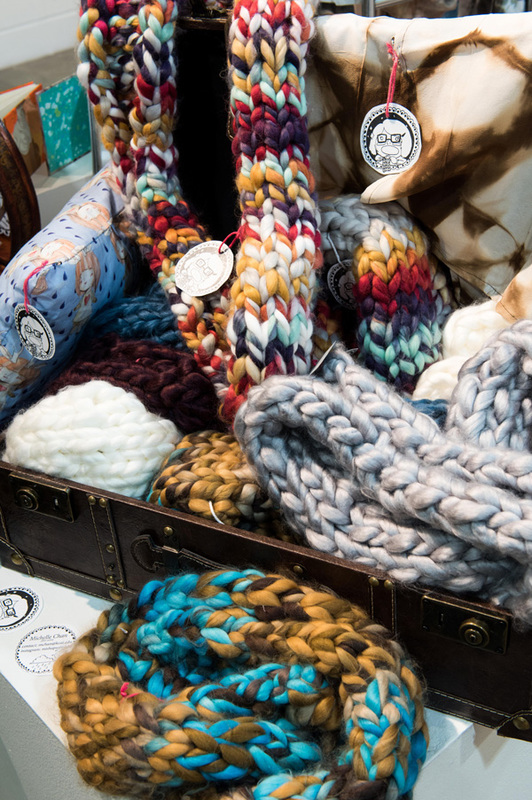 Support emerging artists and find great one-of-a-kind gifts at the Kansas City Art Institute’s End-of-Semester Exhibition and Sale, Dec. 1 to 3. The much-anticipated annual event features affordable works by KCAI students in ceramics, filmmaking, fiber, illustration, painting, printmaking, graphic design and sculpture. Part of the fun is being the first to discover a new talent that may be destined for greatness! The artworks, including scarves by Michele Chan and ceramics by JAD Reyes (pictured at right), will be displayed in studios throughout campus at 4415 Warwick Blvd. ; all proceeds benefit individual students and KCAI studios. Hours are 5 to 8 p.m. Friday, Dec. 1; 10 a.m. to 5 p.m. Saturday, Dec. 2; and noon to 5 p.m. Sunday, Dec. 3. For a campus map visit kcai.edu/campus-life/campus. The last time Sherry Leedy showed Peter Pincus’s exquisite, geometrically patterned cups (left), they flew off the shelves. 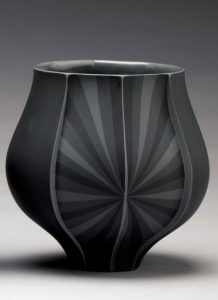 If you missed out, the cups, priced at $150, are back for the gallery’s Holiday Hot Shop of affordable works of art priced from $50 to $500. Also not to be missed are small works, like “Rabbit on Blue and Lemon” (2017) by Nora Othic (below), one of KC’s most widely collected artists. 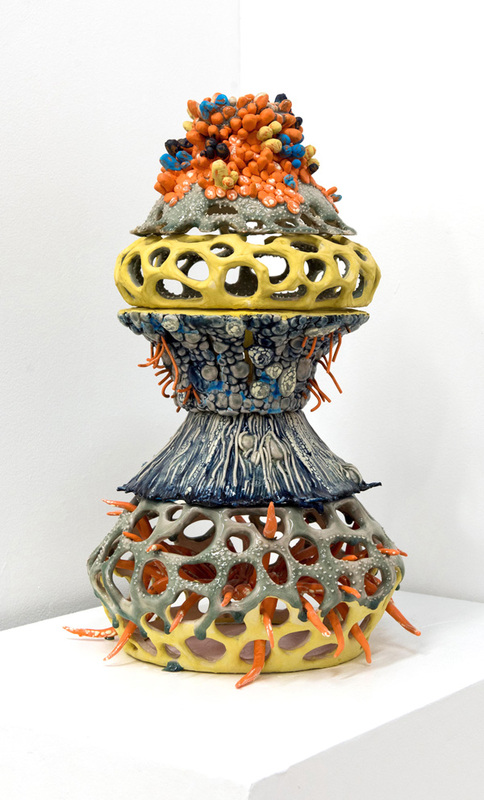 The Holiday Hot Shop opens with a preview from 11 a.m. to 5 p.m. Nov. 24 and will be open for Dec. 1 First Fridays and during regular gallery hours through Dec. 23 at Sherry Leedy Contemporary Art, 2004 Baltimore Ave. Hours are 11 a.m. to 5 p.m. Tuesday through Saturday and by appointment. For more information, 816.221.2626 or www.sherryleedy.com. The Nelson-Atkins Museum of Art’s “Through the Eyes of Picasso” is a jaw-dropping exhibit, pairing masterworks by Pablo Picasso with the singular African and Oceanic masks that inspired him. 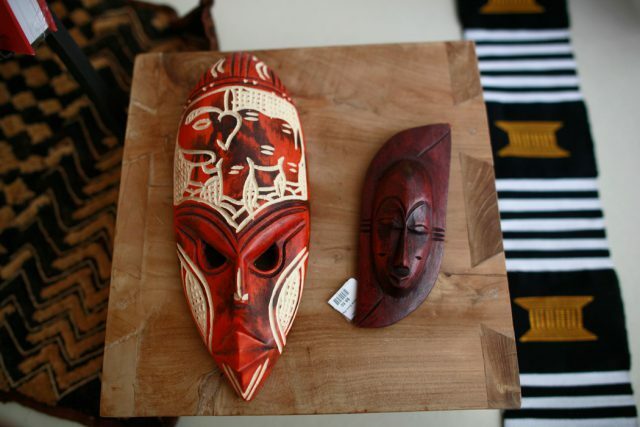 And just in time for holiday gift-giving, the museum store is continuing the exhibit’s celebration of African creativity, offering Ghanaian Fang masks, kuba and mud cloth, and jewelry made from African beads. Ghanaian Fang masks (right), normally elongated with carved lines running from the forehead down to the tip of the nose, hold an important place in Ghanaian history. Fang masks were worn in initiation ceremonies and by spiritual leaders during rituals to drive away evil spirits or as symbols depicting wealth and prosperity. Kuba cloth is made in the Congo and utilizes raffia woven into strips and sewn together. The cloth can be dyed using mud, indigo or substances from the camwood tree, and it is embroidered with patterns that have symbolic meaning. Mud cloth is also adorned with symbolic patterns representing nature, crops, bravery, wealth, the spindle, the sickle, flowers and more. It often shows the social status and occupation of the person who owns it. 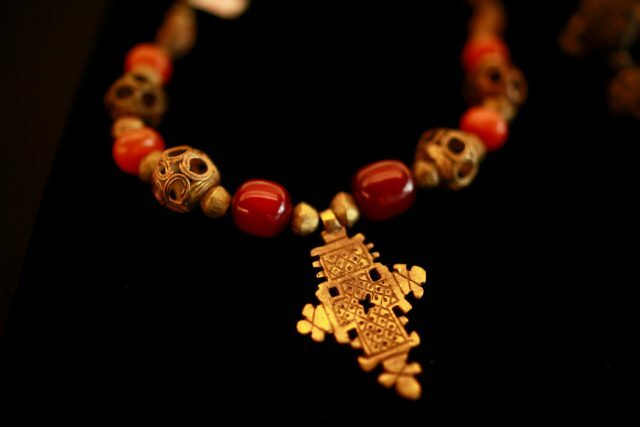 Beaded jewelry has a long history in Africa. Some of the first beads known to be made by hand were found in Tanzania. They were carved from ostrich egg shells and date back more than 30,000 years. Beads are a passion for local artist, curator and “KC Studio” contributing writer Elisabeth Kirsch, who makes jewelry under the name, “Lizzie Drake.” Kirsch became fascinated with Ghanaian handmade glass beads in the 1970s when her uncle returned from teaching biology in Africa and brought her mother beads as a gift. Kirsch began incorporating glass beads into her designs when she started making jewelry in 2010. A variety of her pieces, including the necklace pictured above, are available at the museum store. The museum store is open during regular business hours: 10 a.m. to 5 p.m. Wednesday, Saturday and Sunday and 10 a.m. to 9 p.m. Thursday and Friday.